A new egg story ! Autumn comes and I have a few eggs remaining in the incubator. 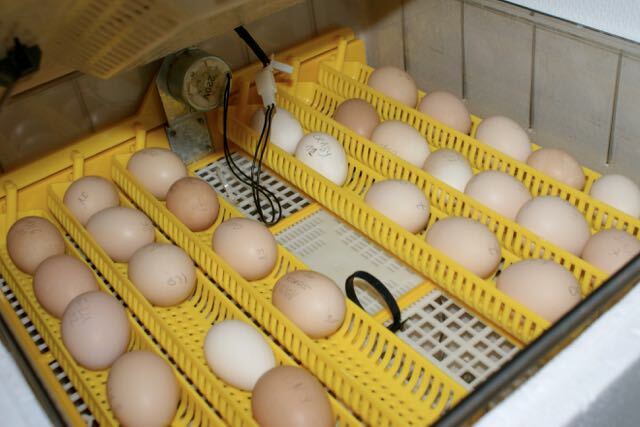 I use these eggs to do fertility tests and I hate interrupting life cycles…Usually I place them under brooding hens, this way I always have fertilized eggs at my disposal if any of my hens want chicks. This is a good solution in most cases. Here in Brahmaland we don’t have any broody hens at the moment and my lack of space to welcome new chicks properly prevents me from letting them hatch. We just have to find a way to work out our schedules in order to take the eggs from Brahmaland to Camille’s place, 15 minutes away. Even if we work together on this blog, the Facebook page, and youtube channel, we don’t see each other very often (unfortunately), we usually work together online. There are two distinct batches with two different hatching dates. Camille will decide to which hens she choses to give the eggs, considering she knows her animals better than anyone else 🙂 . 1 egg : «Ihema 26», from the Blue brahma family : miss Ihema, blue brahma hen and mister Country, blue brahma rooster. The future baby chick will either be blue, black or splash…surprise !! 2 eggs : «Leila 7» and «Leila 8» future brahpis also ! Leila is a blue brahma and our dear Anka is the father once again !